The Labour party meets in Perth over the weekend in a state of such shambles that its outcome is an impossible act of divination. Just 48 hours before the conference no agenda or list of motions had been distributed or even compiled amidst rumours that those in charge of conference arrangements have been inundated with resolutions and counter resolutions. The party’s own apparatus has apparently shrivelled under the viciousness of recent electoral beatings. This is a fact as much witnessed by the conference period dash as by the squalid sight of former Labour MPs reappearing for nomination to regional lists. Yet the flurry of lay activity around the conference does point to a source of rejuvenation. There’s a fight to be had inside the Scottish Labour party. The question now is will it be had? Corbyn represents the best chance for the Labour left in a generation to win back ground in the party. But his leadership is in danger. The strength of his support in the party membership is clear, but it has few concrete moments of expression outside of annual conference. The UK conference at the end of September must be recorded as a defeat for the left and for Corbyn on at least two fronts. First, and devastatingly for the party in Scotland it recommitted itself to Trident. Second, it was the conference for which John McDonnell, the strongest appointment to shadow chancellor Corbyn could have hoped for, committed his chancellorship to supporting Osborne’s fiscal charter. The founding of Momentum as an avenue of Corbyn’s popular support is perhaps the best move made by the left of the party since it formed the leadership. But it is likely to be peculiarly hobbled in Scotland due to its inability to speak to the left on constitutional matters. So much rests therefore on the weekend’s conference. Without a tangible victory over Trident, there is little to restrain the parliamentary party and the media (linked as ever by the tightest nexus) from bulldozing Corbyn’s leadership from here through the 2016 Scottish elections, past whichever by-elections present themselves between here and the 2017 local elections and from there onto an early grave. The UK Labour party desperately needs the added complication of a Scottish party, for whom the nuclear weapons system is native, separating from UK party position. And not just because of the importance of the issue in itself – though nuclear weapons are officially back on the agenda of UK politics, principally because of the Scottish dimension, for the first time since the end of the Cold War. A vote against Trident renewal would be a knock against the party establishment north and south, proof certain to the media that Corbyn’s more ‘outlandish’ policies have a certain grassroots support, and it would breath precious victory into the embattled ranks of Corbyn’s supporters. Now I know that many, most even, Scottish leftists have already made their mind up about Labour and about independence. But those who want to progress the socialist cause aim to fight it everywhere at once. In institutions they believe in and institutions they don’t. It would have been nice to see rather more folk from the Labour left welcoming the SNP membership’s recent conference triumph over land reform. It would have been good if rather more noise had been made over the Green party’s recent policy upgrade supporting the Palestinian people. But none of these shortcomings award the pro-independence radical left a certificate of abandonment for the Corbyn project. Even those who, like myself, always viewed the ‘recapture’ of Labour as an essentially short-termist and doomed venture, must recognise the value of a fight to keep this particular institution, not just of the union but of Scottish public and intellectual life, a real home for some kind of leftist tradition. The Labour party is an increasingly insular world. The left’s fight for survival against internal Labour enemies hangs around its political imagination like a fog. But a live fight it still remains. Whatever ground can be won, must be won now. Another chance is not coming hereafter. All that is left of the once people’s party is the skeleton of machinery which provides a career ladder for certain politicians. The fact is that even with a left wing leader nominally in charge of the party (Corbyn that is not Dugdale),they have to abstain on policies which might frighten England’s voters into believing that they stand for socialist values rather than Thatcherism. Labour in Scotland can debate and decide anything they like but the real decisions continue to be taken in Westminster where the politics of England dominate and dictate outcomes. I don’t believe that is a quote from the article. No. It would merely provide a figleaf: a convenient claim of intent with no means of implementation. Official “Scottish Labour” opposition to Trident is utterly meaningless without being an Independent party. Absolutely Ken. But as usual the unionist friendly media will big it up as their “Damascus” moment. Aye right. So, if I understand what you are saying, you hope there will be a debate on Trident which ends with Scottish Labour voting against its renewal because this would be a source of encouragement to those who support Corbyn. I presume you have seen the breathtakingly insulting statement signed by Corbyn and Dugdale regarding Scottish Labour’s independent status. I presume too that you have been witness to Corbyn’s mind numbing ignorance of and apparent disinterest in Scotland except in so far as it can subjugate its interests to the big prize of Labour power in the UK. Whatever way I look at it Corbyn and those, apparently including yourself, who want to give him succour are no different from the shower of unapologetic users who got their marching orders from Scotland at the GE. You want to USE Scotland to further your own ends. Well I hope ‘Scottish Labour’ come out against Trident because that would be the right thing to do. If co-incidentally it benefits Corbyn then I guess that is a price that will have to be paid. Sad, though that the so many on the left can only ever see Scotland as an opportunity to exploit. I suppose that is the point at which left meets right. What Arthur Thomson says with bells on. As a left-wing voter all my life , I look at Kezia Dugdale , the execrable Jackie Baillie et al and find that I have nothing in common with these people . Corbyn , so far , holds out no hope for those in Scotland who want to see a truly Scottish Labour party given his dismal repetition of the party line we have heard for decades . I am struck more and more by how irrelevant WM-based parties are to Scotland. They have nothing intelligent or imaginative to say to us and can only repeat the same tired old cliches and slogans. If Scottish Labour (sic) truly wanted to make a come-back they would break from London Labour and support Independence. I fail to understand why they can’t see that, because there is absolutely no chance of them winning a UK general election for at least another 10 years, if then. So their arrogant myopia will condemn Scots to the nastiest, poor-bashing, rich-rewarding, inequality supporting government for the foreseeable future. It’s an appalling prospect. Yeah, let’s go back years and waste our votes again. I was speaking to a pensioner in a cafe in London, he came from Stepney. He said he wasn’t Labour now. When I asked him about Corbyn he said he reminded him of that time and he didn’t want to go back to that again. labour in Scotland are looking like a figure of fun, but they don’t get it! keza as we know hocked her values to all and once rejected joined labour to be lord fukesake’s PA. The branch office monicure given to labour by the previous leadership incumbent is coming home to roost and damn the current incumbent. i.e. keza. How can a Scottish branch office go against the central London office on policy and if they differ, remain as a subservient of London? Seems keza has a brass neck and will lie to the Scottish people, is this the reconnecting strategy of Scottish labour we have heard since Adam was a lad? Who Corbyn is or perhaps more accurately who his handlers are, was revealed during the tax credits row – a position to the right of the Lib Dems for **** sake! And this from a supposed far left wing socialist fanatic – I dinnae think so. The puzzling and curious Chuka Umunna episode at the beginning of the Labour Leadership race now becomes a bit more explainable – his “people” obviously hadnae been given their script in time! The BBC are reporting that Scottish Labour will restore tax credits in the Scottish Parliament. That’s an interesting development and it would be interesting to see if tax credits could be restored using progressive taxation in the parliament. Still has nothing to offer me , Slab need a McCorbyn , not a dug(dale). Slab for all its members in the political spectrum has yet to forward a true leader , they are lacking anything other than what appears to be Blairite puppets , I do really mean puppets , once you watch them in media a few times all that are missing is the strings , but we know they are there dont we….after all if their former leader says so? They are politicians whom look like a cross between a rabbit in the headlights and some Rainmanesque impersonation , rattling off “who is on First , no , who is on second” , where the text is replaced with party mantra dictated from south of the Border , even when its proven wrong its still repeated verbatim – for the entertainment of the educated electorate whom said ” I told you so”. This along with the erasing of the core beliefs of their founder Hardie , himself ironically being celebrated in Perth , ie for Self Rule , and Dewar on Independence , means that they are lacking not just a coherent ideology but reinventing the old one to suit English Labour , perhaps to keep them in their lucrative positions…. yet that did not work for them in May though did it? After May they should have had a good look at themselves , and asked why the party is heading the way of the Tories in Scotland , while the Tartan Tories take up their jobs. But did they , no. Instead they put their heads in the sand , perhaps the metal detector was broken and they could not find their pieces of silver , and carried on in a form of mania , one often highlighted as a sign of madness…IE to repeat the same process and expect a different outcome. Just how can one expect the electorate vote on a party to have in power , when it lacks its own internally , the same can be said of their lack of ability to adapt and overcome , which I assume is a trait one wants in politicians in times of crisis. There is though some hope , there is still some of the red tie left in Scotland , whom now have tasted unemployment , so should be a little more to the left than before. But I fear they are Fouked by association. Anyone have a lock of Jimmy Reid hair , I have a contact in a North Korean Lab that owes me a favour. Without one of these , there is no Slab future. The Tartan Tories are grooming leftist prodigies , ones that have a core belief that indy is the true goal for Socialism in Scotland , and is incompatible with the current and supposedly Socialist based politics of Labour of today , and since 1990. If one can use a footy analogy , its like Jock Stein and Celtic when they signed protestants , knowing that Rangers would not sign catholics. But does the party have another 20 years to wait for its Souness to be in charge? As long as SLabour doesnt return to the table with a commitment at least on FFA , the above paragraph will be the status quo , they will not be able to coax that vote from the old voters with Blairite clones , thus the Tartan Tories can march on with their socialist pretenses…benching the good players to reserve games. Trident , nothing to see here , move along. It will remain in Scotland , with or without Corbyn. Trident will remain in Scotland until independence is achieved. There is no appetite to get rid of it in rUk – their government has made a neat arrangement to protect them whilst foisting their toxic weaponry on the mugs next door. This is one of the key challenges for the Scottish electorate. It takes courage to tell the known thug next door to get his rubbish out of your garden. The more so when you have had it instilled into you that all you can do is to offer up a fear grin and roll over. There are signs that the worm is turning. The Scottish Labour section of the Labour Party UK are caught between a rock and a hard place for example Kezia Dugdale supports renewal of Trident and the delegates at the Scottish Labour section conference on Sunday will probably vote to scrap Trident so Kezia Dugdale will be leading a section of the Labour Party UK whos policy she does not support. Then we have the same situation with Jeremy Corbyn who supports the scrapping of Trident and his Labour Party MPs in Westminster will probably vote to renew it. The conclusion is that its the Head Office that’s in charge and the Branch Office of the Labour in Scotland will not be listened to and have no influence in the decision by the Head Office in Westminster to renew Trident. I expect the SNP with a clear policy to scrap Trident to instigate an other Tsunami at the Scottish elections and wipe out the Scottish Labour section MSPs and would not be in the least surprissed if Kezia Dugdale loses her seat as alot of the electorate are fed up by her constant whinging, moaning, bleating carping and putting Scotland down. I expect Kezia Dugdale to lose her seat or alternatively due to the disastrous results at the next Scottish elections resign by June 2016, I expect that Jeremy Corbyn will be challenged for the Labour Party UK Leadership or resign by August/September 2016. 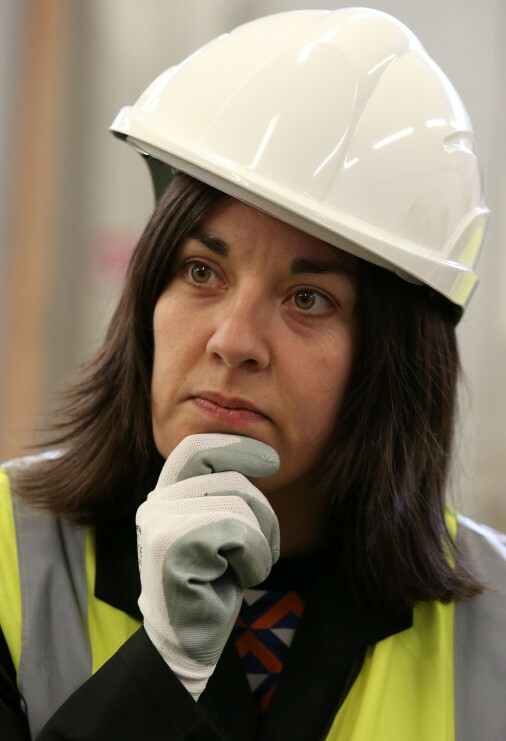 Is Kezia Dugdale not a list MSP, which means she has no seat to lose?